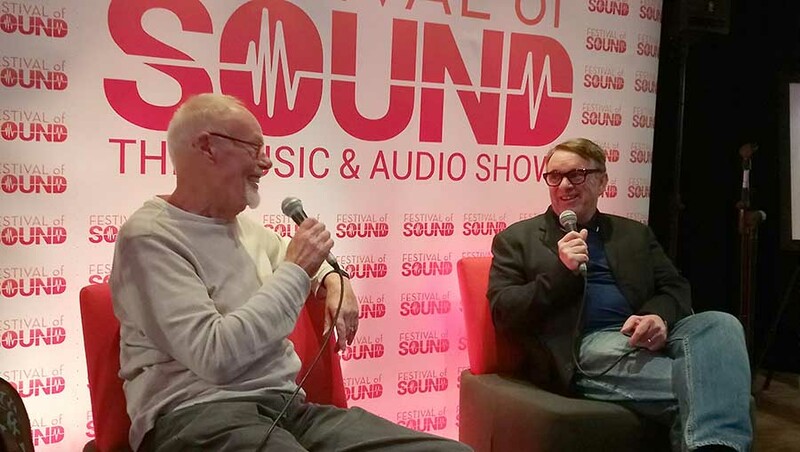 Janine Elliot attends Festival Of Sound and pops along to see Whispering Bob Harris and Chris Difford’s presentation. The Hammersmith show in September was re-branded this year as the Festival of Sound having been previously called The Festival Of Indulgence in earlier years, and indeed there was much emphasis on live music to perhaps bring people in who otherwise wouldn’t go to a Hifi show. Whilst there was a good chance to hear music emanating from loudspeakers in rooms on the first two floors of the Novotel Hotel, just a short walk from the busy Hammersmith Underground station in central London, there was also live music performed on all floors within the hotel plus a chance to hear from folk who have made an impact on the music business over the years. 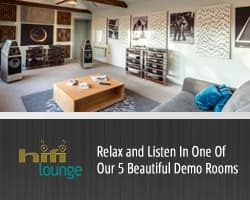 Indeed, the lower ground floor was set aside for live music performed through a very large Bowers and Wilkins sound system. Whilst my own visit to the show on the Saturday didn’t give me time to take advantage of listening to much of the live music I did want to hear from those who have made a big impact on the music scene, whether producers, radio presenters or sound engineers. One of the most important persons to popularise the music scene was whispering Bob Harris, OBE, whose “Old Grey Whistle Test” on the BBC was one of the most iconic shows ever to hit the airwaves during my childhood. His relaxed voice gently introduced me to music that has stayed a part of my life ever since, and I was even fortunate enough to meet him during my own years of working as a sound engineer at the BBC. Here at the show Bob was interviewed by Chris Difford, from the mid-70’s new-wave band ‘Squeeze’, talking about his past at the BBC and his life with Hifi. 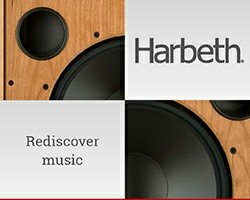 His first piece of “Hifi” like many in the late 50’s was a Dansette record deck, though he did progress to a massive wooden Decca stereogram balanced on its 4 spindly legs in the 1960’s, when he was about 15 years old. His introduction to making programmes of his own was similar to me in my own small bedroom; using a Grundig tape recorder with microphone held in his hands and playing tracks from the auto-changer turntable. He would hold the microphone in front of the speakers and then move it away at the ends of the tracks to fade into his vocal link where he would be talking about the music and introducing the next track in the time it took between one record finishing and the next one falling down on top of turntable platter and starting! He had no mixing desk or Studio Manager to control the session. Whilst it wasn’t state of the art it he found it fun and meant a lot to him seeing the expressions of folk listening to the programmes when he played them back to them. This inspired him to think about perhaps doing this as a profession. He was very much inspired by one key broadcaster of the day, David Jacobs, with his radio show “Pick of the Pops” between 1958 and 1961. Bob’s mum actually wrote to David to dedicate a song to her son “Robert Harris” on his 15th birthday (he didn’t like being called Robert! ), and so began a correspondence between Dori (Bob’s mum) and David that lasted for many years. Indeed, she met him face to face a few years later. Bob’s biggest inspiration, though, was John Peel and his 1967 late-night programme “The Perfumed Garden” on the pirate station Radio London. Playing music from The Doors, Love, Jefferson Airplane, plus poetry and discussion meant he was riveted to the programme and which influenced his own approach to broadcasting in the future. Indeed, John Peel’s laconic style probably inspired him. Bob co-founded ‘Time Out’ magazine with a friend, and Bob very much wanted to interview John. During this time he met stars such as Marc Bolan from T Rex, starting a long friendship until Marc’s untimely death. In 1960 having introduced himself to the BBC he sat in for John Peel on 4 occasions doing editions of “Sounds of the 70’s”, a programme concentrating on albums rather than singles between 6 and 7pm during the week. There began his long career on radio, including Radio Luxembourg and more importantly into television presenting his “Old Grey Whistle Test” in 1972, continuing the theme of non-chart album music and with his distinctive laid-back velvety voice. As well as great bands it did include several that he probably would rather have not included; one springing to his mind being the Poodles! I always wondered why it was called the “Old grey Whistle Test”. Apparently, this is a phrase from USA’s Tin Pan Alley, where after pressing a new record they would play it to people (“old greys” who were doormen in grey suits) and any song they could ‘remember’ and whistle would therefore pass the old grey whistle test. The Old Grey Whistle Test was unlike the only other music show on the air at the time, ‘Top of the Pops’, in that it was a “serious” rock show playing music from albums rather than just top-20 singles. He loved the chance to have great musicians in the spartanly decorated studio, referring to the music as a “by appointment experience”; there was no video recording or playout systems in those days, so the show would rarely finish exactly on time. Luckily this was the last programme on the air on the day, so he could just let the music play until it came to its own timely end, to only be followed by the infamous revolving BBC 2 logo and then that dot on the screen that got smaller and smaller until it disappeared. There was no News 24 following broadcast in those great days. Bob was very clear about how the music business and music playback has changed over the years. He referred to his formative years as the “golden era” of music, particularly of Queen and genres such as New Wave and Punk. Today’s music “is so different”, he explained, with no careers in the way they were in the 60’s and 70’s. I nodded in agreement as he explained that unless you had one million plays on Spotify you haven’t made it; my own music hasn’t even netted thousands yet! He turned to the scene in Nashville for the life and soul of the music business. The influence of the music scene from across the pond was paramount in Bob (and indeed John Peel’s) careers. The whole business has changed in recent years and I sensed from Bob that he was perhaps a little saddened at how it has all morphed since his days of screen eminence. This linked well to his feelings on how the replay system has changed for the worse over the years; from vinyl to CD’s “cramped at the top end” to digital “cramped at the middle”. It was clear that he didn’t like the digital world. 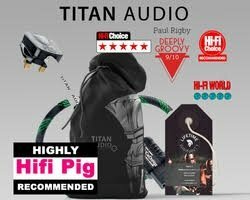 Being part of this show in London where he could wander around and hear some impressive audio did, however, give him a sense that things were perhaps not all that bad in 2018, with so much analogue taking prominence in this digital age. 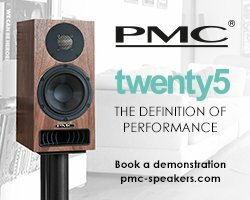 He particularly complimented the new top-of-the-range £47,000 PMC FACT Fenestria speaker system, a speaker I heard and loved at Munich earlier this year. This show, however, was more than just Hifi, and Bob liked the idea that it had been re-branded as “Music”. If only there were more rooms and more music; this might have been a small show compared with Munich, for example, but actually it didn’t lessen the enjoyment and the public and press visiting seemed to enjoy it as much as Bob did. There was much to see and a number of items that took my fancy, and which will hopefully find their way to my house for a review on Hifi Pig later this year, such as the Mr Speakers Voce electrostatic headphones, Vertere’s soon to be released mid-priced turntable (CEO Touraj refers to them as record players, as of old!) 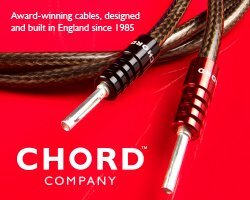 with its very clever flat arm, or the new two-piece pre-amplifier from Townshend Audio. Stay tuned! More coverage from Festival Of Sound here, here and here.